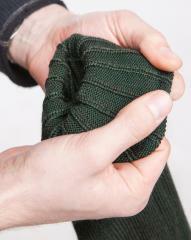 The Finnish army boots socks are real good, but make them out of quality merino wool and they get even better! Just like our army issue socks, but a little better in every way. The natural moisture wicking properties of merino wool make these a viable option for around the year use. Merino wool makes for a perfect base layer, to minimize chafing you can wear thinner socks under these, for example our standard merino socks. In cold weather conditions you could wear a pair of thicker socks over these. 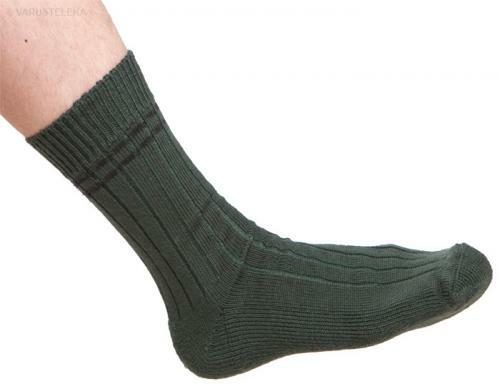 Layering socks makes life better, it minimizes chafing and if you've chosen your materials correctly (can't go wrong with wool) double layered socks will not feel uncomfortably hot or too damp even in hot weather. The footbed side is terrycloth. This means the sock won't slide and wrinkle when worn. And oh yes, this stuff is mulesing free! In line with FDF standards, the amount of stripes on the cuff indicate size. We might have some sizes with old stock where amount of stripes may vary, but the sock is the correct size (as printed on the carton) in any case. I just love these, I use them always together with Särmä merino socks underneath. Perfect socks for hunting and outdoors. Surprisingly warm, even when wet/sweaty. Pirun kivat! Särmä TST Saapassukka + Särmä Merinosukka -kombo on korvannut Lorpenin sukat ainakin meikän vaelluskengissä. Nyt neljä viikon mittaista keikkaa on tullut heitettyä tällaisilla komboilla. Viikoksi on riittäyt hyvin kaksi paria kumpaakin sukkaa, yksillä pareillakin varmaan selviäisi kun sukat jaksaisi jossain välissä huuhdella. Yksi tähti pois saapassukkien pienestä huopumisesta. My feet sweat like hell no matter what the weather so switching to these socks from cheap cotton ones was an amazing upgrade. I've been rotating a pair continuously for 2 weeks and so far no bad smells which is astounding considering my feet can normally be considered biological weapons after long hikes. Decent socks, slightly cheaper than comparable products elsewhere. Have bought twice without issues. Very impressed. I haven't hiked with them yet, but these are thick AF and feel tough - yet confortable. Excellent every day sock. I have many prs and have used them all this winter. I think I'll end up using them this summer too. They seem to hold up well so all in all much better than cotton sport socks. Excellent. The thick bottoms and high wool content create a sock that is super versatile. These are thick enough you notice happy feet, but not so thick to require up sized footwear. Material was placed in the correct spots! I think these will be fine in the summer in boots, as they breath so well. Well below freezing you could put a sock over or under these just as easily too. 5 pair and counting, these are worth it. Man, I did not think the under-sole cushioning would be this good! I highly recommend it if your shoe/boot allows the extra thickness. These are awesome socks! My first pair of Sarma brand and I am very happy with them.highly recommended! Aluksi olivat hyvät sukat mutta jo varsin lyhyen käytön jälkeen kuluu ja alkaa pyörimään jaloissa. Minun toiset kohta jo puhki. Materiaali ei ole tarpeeksi kestävää, en tiedä johtuuko merinovillasta vai mistä. Intin saapassukat ovat paremmat, pysyy paremmin jalassa ja kestää. The best socks I’ve ever had. Love them when the winter begins. I wore these for Desert Brutality 2019 and they absolutely saved my feet. Great socks!